In June 2015 I moved house so I have begun a new post about the new garden and am closing down this post. Take a look at our new garden here. We moved into this house in 1999 and, being brand new, it had no garden at all. Over the years we have developed the garden and since 2011 we have featured the best plants in this photographic journal. Photographs are not updated every month but I’m sure you’ll get a feel for what is at its best at different times of the year. A selection of plants in flower how starting with Scabiosa ‘Butterfly Blue’ which has grown really well this year and has been flowering for weeks. A couple of my latest Clematis; Clematis x durandii and Clematis Viticella Madam Julia Correvon. Abies Koreana Large Blue Cone Korean Fir Tree looking nicely blue but they are really sticky! And in my small hanging pots, the annual Verbena to bring in a flash of colour. This Clematis is growing through an Ivy and has just appeared so I don’t know the variety. A couple of years ago I planted this Linaria vulgaris (toadflax) and it is thriving; in fact, it is taking over a bit but I love the bright, fresh lemon shades so I’m reluctant to pull it out. The weather so far this year. here in St Helens, hasn’t been too bad really. We didn’t have the heavy downpours that were seen down south and it has been relatively mild. However, this time last year was similar then we had a week of heavy snow (scroll down to see the photographs) so I’m not relaxing just yet. Last year I cleared out one of the flower beds near the front of the house and planted a few shrubs so this is the first season for theChaenomeles × superba ‘Pink Lady’ (Flowering Quince) which I think is lovely. I also planted the variety “Crimson & Gold” which is looking good too. The other main points of interest are these Dogwoods; Cornus ‘Sibirica’ and ‘Flaviramea’. They are still quite young but I’m hoping that, if I prune them every year, that they will grow into good sized, brightly stemmed shrubs. December 2013 – I haven’t updated my Garden post in some time so here are just a couple of the highlights from the last few months of the year. I entered a competition and managed to win a bug hotel which is now, hopefully, home for a few beneficial insects. Click here to find out more. In November, during my winter tidy-up I came across this bird house at the back of one of the borders. We must have put it up on the fencing when we first moved in and over time the Ivy grew over it and it was forgotten about. At least one family of chicks started life there as there are remains of an old nest. I will clean it up and put it somewhere where I can see it and hope it attracts a new family in the future. July was a glorious month with sunshine nearly every day and the highest temperatures we’ve had for years. The garden managed well without watering although the pots had to be watered every day to keep them looking good. At the end of June, just as the hot weather arrived, I planted a Camomile Walkway under my rose arch; I had to water it every evening but by the end of July the plants had all taken and knitted together well. Since planting I have extended the area under the archway and have ordered 25 more plants to complete it. Here are some more photographs taken during July including a ladybird finding its way around a Teasel flower head, a Pygmy Waterlily in my small water feature, a Blackbird taking a rest in the blazing sun, a red rose which showed up in my Ivy (it must have come over from next door as I don’t remember planting it) and my scented climbing rose trained across the front of the house. May and June 2013As in previous years the Lilac has done us proud; the scent has filled the garden for a couple of weeks now, a few branches in a vase in the house sends the scent throughout the house too. At the same time as the Lilac is in flower the Montana is also flowering in abundance. The pink variety, Elizabeth, has a subtle sweet, almondy scent which is at its strongest in early evening; after a hot, sunny day it also fills the garden. The Tulips were late blooming this year but as a result we still had a great display well into May and we also had a little visitor to our water feature. These Iris have been in my little water feature for about 3 years now, this year they have bloomed really well. I’ve had a few Himalayan blue poppies (Meconopsis baileyi) over the years and have never been able to get them to live longer than a season never mind to reflower. However, the one I bought last year from Crocus.co.uk came through the winter and flowered yesterday; doesn’t it look great! 16th April 2013The weather is finally warming up so I couldn’t resist a photo of a sunny corner of the garden and my dark blue Pulmonaria (don’t know the variety). 23rd March 2013This entry is not really about plants but more about the weather as I’m sure that in the years to come I’ll forget about the amount of snow we had the week before Easter.It snowed all day yesterday and last night so this morning it was about six inches thick and when I looked out at the garden this morning the first thing I noticed was my Camellia, which was standing tall, full of plump buds waiting to burst open, was now laying flat, covered in snow. I rushed out (well it took a while as I couldn’t open the back door because of the snow, so I went out of the front door and tried the side gate but that was blocked by a snow covered conifer. Finally I got into the garden via the other gate) and knocked the snow off the Camellia. Hopefully it will be ok if we can get some good weather.Update 16th April 2013Scroll down to see how the Camellia is looking now that the weather has warmed up! Here are some other photographs of our snowy garden. Spring is here in Merseyside with lots of sunshine over the last few days and we haven’t had rain for weeks! There isn’t much going on in the garden but the small daffodils and the snowdrops are out. My current pride and joy are the three Wendy’s Gold Snowdrops which I bought last year and which are flowering their little heads off. My new climber Clematis ‘Princess Diana’ growing through the Ivy; new this year so very pleased it has flowered already. And below; looking lovely in the sunshine, is Japanese anemone ‘Honorine Jobert’. They are slowly creeping around the garden, it will be interesting to see where they end up in the years to come. This was a nice surprise. I sowed a number of seeds from a variety of Papaver somniferum (opium poppy) and the first one to flower is this lovely bright red. Acer shirasawanum Aureum – My brother and I have wanted one of these for years but they are very expensive. However, I decided to treat him for one for his birthday last year but I couldn’t find one in my price range. In the end I ordered one from Bents Garden Centre near Warrington. It took nearly a year but finally it came in stock and it is absolutely beautiful, so beautiful I had to treat myself too. I’m going to keep it in a pot and display it along with my other Acers. Hosta ‘Remember Me’ – I bought this lovely Hosta at the Tatton Flower Show many years ago. It was very small when I bought it but it’s grown into a real beauty and, so far, it never gets damaged by slugs or snails. I have jus repotted it into a larger pot and already it’s put on growth. Climbing Hydrangea (Hydrangea anomala subsp. petiolaris) – this has been growing against the north facing house wall for the last 13 years. It is slow growing and needs cutting back to the wall every few years but it always puts on a good display. Peony (Paeonia lactiflora ‘Bowl of Beauty’) – I have three of these shrubs in my garden. Every year they flower well but, usually because I forget to stake them, they end up flopping over the beds and lawn and the flowers are not seen at their best. This year the weather hasn’t been very good at all with lots of rain and winds so I decided to cut them just as the buds start to open. So far I have had six big vases full of these lovely flowers and they are in a place where I can appreciate them every day. Over the years I’ve planted a number of Clematis in the back of the main border and then forgot about them. This year they have managed to reach out to the top of the other shrubs and trees and are flowering their heads off. 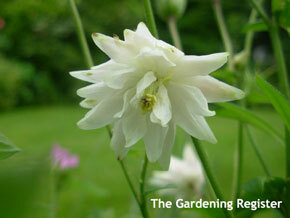 And the Aquilegias are all doing well despite the rain. Another photo of our Acers just because they look so lovely in the late sun. Acer palmatum ‘Bloodgood’, Acer palmatum ‘Orange Dream’ and Acer palmatum dissectum ‘Garnet’ in the background. Update April 2014: I have just recently found out what this is; it is Allium Triquetrum, a type of Wild Garlic called Three-cornered Leek (or Garlic). Here is a link to a Wiki Page which gives more detail, in particular the shape of the leaf which is quite unique: http://en.wikipedia.org/wiki/Allium_triquetrum. Apparently they are great in salads or as a Pesto instead of Basil so I may give that a try in the coming months. I always loved Auriculas but was under the impression they were difficult to grow so would always be beyond my capabilities. However, following a conversation on PInterest I decided to give them a try. I ordered a Auricula Selfs Collection from Woottens Plants. The collection consists of six plants, one each of; Toolyn, Cortina, Bright Ginger, Moonrise, Chiffon and Wedding Day. They cost me around £27, which I thought was good value. They arrived in small plastic pots and, although quite small, they all had a good number of leaves. I have kept them in my cold conservatory since they arrived and they have all grown well and today the first one, Toolyn, flowered. When the weather warms up I am going to repot them into terracotta pots and put them outside for the summer. Hopefully they will all flower before the end of the season. Was fortunate enough to have the winning bid on two Wendy’s Gold Snowdrops (Galanthus plicatus ‘Wendy’s Gold’). They arrived in flower so I was able take a few photographs before it died down. Fingers crossed they come back next year. Not added any photos for a while but here is a photo of my first daffodils of the year, quite early I think. The second photo is of my Camellia which, again, I think is flowering earlier than usual. The final photo is of an Orchid in my conservatory. I got this from Chester Zoo when on an Orchid course so I’m not sure what is is called but this is only the second time it’s flowered for me and there is another flower spike ready to burst open. It’s been months since I’ve upload a photograph of the garden, mainly due to the fact that there has been nothing that has looked particularly good. However, I felt I had to load this picture of my Acer Orange Dream which is looking absolutely wonderful; the best it ever has. Mitraria coccinea Lake Puye form (Gesneriaceae). This is an evergreen shrub which I have growing against a very shady fence. Despite the shade, every year it produces these wonderful red flowers. It likes partial to full shade and a well drained acidic soil. I bought mine from Crug Farm a number of years ago and, although they are out of stock as I write this, they still have it on their list. Along with my Acer my favourite plant is my Chinese dogwood (Cornus kousa var. chinensis). At this time of year (early May) it is covered in these amazing bracts then in autumn they turn into bright red fruits which last well until the frosts. I’ll post a picture at time. I’ve fallen behind a little with my Photos of the Week, I’ve taken them but haven’t had time to put them on the website, so here are the last three weeks. First is my lovely Tree Peony, I’m not sure of the variety but the flowers never cease to amaze me. They are a good 8ins wide and this year it produced six of them. The tree itself isn’t very big and, if I’m honest, a bit ugly, but the flowers are worth it. Second is my Ribes again but this time in full bloom. My photo of the week (19th April) has to be our first Asparagus at the allotment. We moved a number of crowns from my brothers garden to the allotment a few weeks ago and already the spears are showing through. Because the have been recently moved we won’t be able to pick them for another year yet. Here are my photographs from 17th April. Looking really good at the moment is my Cherry Tree – Prunus avium Stella; if the amount of blossom is anything to go by there should be lots of fruit this year. I just have to get to them before the birds! This week’s photograph (3rd April) is my Magnolia in flower. This week’s photo (24th March) is of my Ribes sanguineum ‘Pulborough Scarlet’ (flowering currant), which has been in the ground for around 8 years and looks great every year. For w/c 14th March I have chosen the Pulmonaria (Lungwort) again as there wasn’t an awful lot going on in the garden. I think I need more early spring interest. Most of the pink has gone but it is such a lovely blue it is worth sharing. This week’s photograph is of an emerging Paeonia delavayi (Tree Peony) which is my pride and joy. It has massive clear white flowers with a red centre. I don’t know the variety but I’ll post a photo when it’s in flower. As a little extra I’ve also included a photo of my friendly blackbird. Today, 3rd March, I bought a few colourful primulas to brighten up my patio. What a lovely sight with the sun shining on the flowers. Even on a dull day these will look bright and cheerful. I bought my primulas for just 69p each from my local florist but they are available during March from most garden centres and places like B&Q. 23rd February 2011. Isn’t this lovely for this time of year. My Pulmonaria (Lungwort) has just started flowering and has lots more to come. I love that both the blue and pink flowers come out at the same time. I can’t remember which variety this is, if you know please leave a comment below. This weeks’s photograph (taken 14th February) is of my Magnolia stellata (star magnolia). It is probably not planted in the best location as it gets quite windy and because of this I think the flowers could be better. I love the buds at this stage; all full of promise. This week’s photograph (taken 7th February) is of my Clematis Macropetala ‘Markham’s Pink’. I planted this clematis along with Clematis Macropetala ‘Lagoon’ either side of the arch leading to my lawn. This is only it’s second proper season so I’m looking forward to a great display in April. This week my Corsican hellebore (Helleborus argutifolius) has started to bud. This plant is evergreen so is always there and changes are not always noticed. But when I saw the lovely big, plump buds I thought it had to be my favourite for this week. Photo taken 1st February. This week my Witch Hazel (Hamamelis ‘Arnold Promise’) is flowering well and looks lovely but unfortunately it doesn’t have a very strong scent. It has been growing in a large pot for a number of years now and always seems to do well. Photo taken 24th January. As a bonus here is a photo of, what I like to think of as ‘my’ Robin keeping guard over his territory. Also at this time of the year the Camellias are in bud just waiting for the weather to warm up to give us their wonderful colourful displays. Mine is Camellia x Williamsii Debbie has been on a container for about eight years now and it has always flowered well. Photo taken w/c 17th January. I love this time of year when the spring flowering bulbs are emerging from the soil. This is w/c 10th January and it is one of my pots of bulbs just waiting to burst into life. This photograph is already on the site. It was taken w/c 3rd January and is of my Calamondine which has been in full bloom in the conservatory. The smell is just as strong as ever.